The Fiji Airways Drua have made a promising start to the Australian National Rugby Championship by thumping Melbourne Rising 40-17 in their opening match at Ratu Cakobau Park this afternoon. The first points of the match came in the 28th minute after Melbourne Rising wing Tom English got a try after some great work at the back of a scrum inside Drua’s 22. It just took a minute for the Fijian Drua to respond after some sloppy play by the Rising inside their 22 which gave possession back to the Drua and Levani Kurumudu ran to score between the sticks. Alivereti Veitokani then stole the show in the 35th minute after breaking the Rising defense from inside Drua’s 10 metre line and combined well with Frank Lomani to get Drua’s second try and put Fiji ahead 14-7. Apisalome Waqatabu was successful with both conversions and the Drua went to the breather seven points ahead. The Fijian Drua started the second half with a bang as Apisalome Waqatabu eased his way to the try line just in the second minute after an instrumental Frank Lomani set a wide pass over four Rising defenders. The Rising got their second try through Justin Masters in the 55th minute of second half after a cross kick from first five Archie King. Drua responded well just after a few minutes and with some great offloading, Serupepeli Vularika who came off the bench touched down Drua’s fourth try. 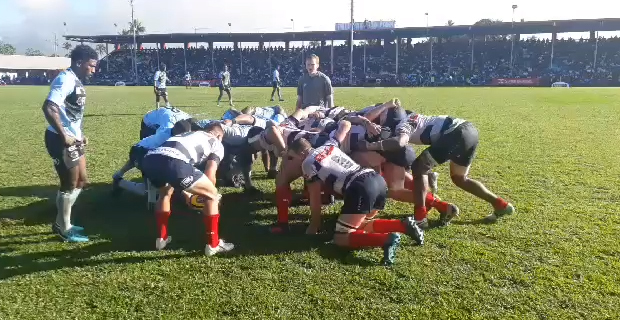 This did not stop and the Drua continued the momentum and some fine quick passes saw the Drua score their fifth try through Mosese Ducivaki in the 59th minute. A great chase and a charge down saw Avete Daveta crossing the try line and getting the sixth try for the Drua in the 75th minute. The Melbourne Rising found great difficulties in containing the offloading and high intensity game of the Drua. Tom English scored the last try of the match in the last minute of the game but was not enough to get the win for Melbourne Rising. The Fiji Drua will face Brisbane City at 3pm next Saturday.